1. Preheat the oven to Gas Mark 4, 180 degrees C, 350 degrees F. Line a square baking tray or swiss roll tin with bakewell parchment. 2. In a large bowl, whisk the egg whites until very stiff. Add the caster sugar a tablespoon at a time, whisking well between each addition. 3. Fold in the icing sugar, cornflour, vanilla essence and vinegar. Pile the mixture onto the prepared baking tray and using a spatula, smooth out and level off. 4. Bake in the oven for 15-20 minutes or until firm on the top and soft in the middle. Set to one side for five minutes to cool. 5. Place a sheet of greaseproof paper on a tabletop. Turn the meringue upside down onto a new sheet of greaseproof paper and carefully remove the bakewell parchment. Spread over the thickened cream, leaving a 2.5cm (1 inch) border around the edges. 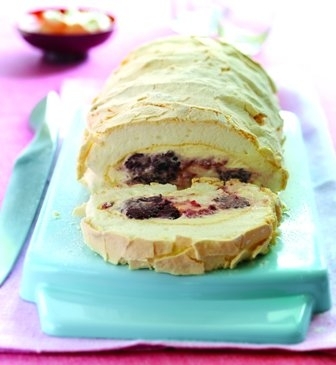 Scatter over the fruit and roll up like a swiss roll lifting the paper as you go. Place the roll onto a serving dish and just before dredge with icing sugar. Canny Hint If chocolate is more your thing, replace the icing sugar with 1 tablespoon of sifted cocoa powder for a chocolate flavoured meringue.